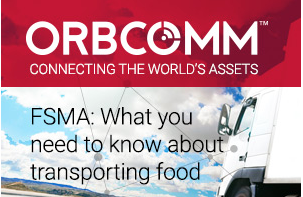 When a company's primary responsibility is to ensure that products are delivered while remaining at the proper temperature and free of contaminants, and is able to keep track of all of this when being transported is a situation that ORBCOMM has taken seriously. ORBCOMM Inc. (Nasdaq: ORBC), a global provider of Machine-to-Machine (M2M) and Internet of Things (IoT) solutions, announced today that it has launched the next generation of its cold chain monitoring solution, ORBCOMM’s PT 6000, which is available as a 3G or LTE cellular or dual-mode satellite-cellular version, enables fuel and temperature management, maintenance, logistics and regulatory compliance for refrigerated transport assets. ORBCOMM’s solution is compatible with every type of refrigerated unit for maximum utilization and seamless installation on the wall of a refrigerated trailer or inside a reefer cabinet. The device supports up to three temperature sensors to accommodate reefers with multiple zones and has a rechargeable battery that reports for up to 10 days on a single charge when no vehicle power is available. In addition, the device is fully integrated with third-party dispatch and in-cab software providers, including Innovative Computing Corp., TMW SystemAdd On Systems, PeopleNet, SSI, and Prophesy. Craig Malone, ORBCOMM’s Executive Vice President of Product Development stated that in refrigerated trucking, it is critical for fleet owners to be compliant with the FDA’s Food Safety Modernization Act, and ORBCOMM’s technology provides the end-to-end visibility and control to meet these regulatory requirements and ensure the highest level of service throughout the cold chain. They continue to see a migration toward IoT technology as part of our transportation customers’ core strategies to reduce costs and add efficiencies, and they are pleased to be the solution provider of choice for some of the biggest names in the industry. ORBCOMM will be at Booth 507 at the in.sight User Conference in Nashville, Tennessee, from August 14-16, 2017. Christoph Kalinski, ORBCOMM’s VP of Food Safety and Pharmaceutical Solutions, will also be participating in a panel discussion at the conference titled, “The Food Supply Chain: Leveraging IoT Technology for Increased Visibility, Optimization and Compliance,” on Tuesday, August 15 at 3:00 pm.